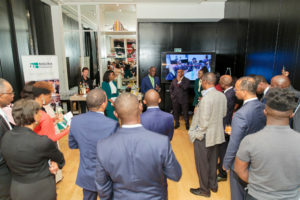 The Nigeria Higher Education Foundation (NHEF) hosted a Fundraising Cocktail Reception on September 25, 2018 at the Andaz Hotel located on New York’s Fifth Avenue. 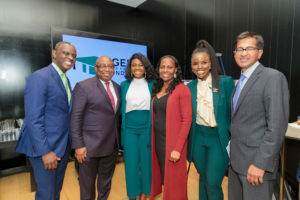 The event commemorated our celebration of the NHEF Scholars Program milestone of providing skills, training and real-world work experience to almost 100 Nigerian youth. 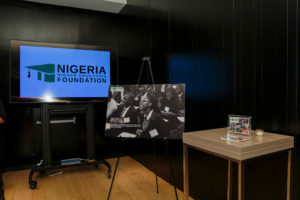 The NHEF Scholars Program was launched in 2016 with the goal of increasing the number of well-educated Nigerians assuming positions of responsibility and leadership in Nigeria, and across the globe. Since then, we have worked with our partner universities to discover academically inclined and leadership-oriented undergraduate students in their penultimate year, and nurtured their career development by providing intensive career and skills training, internships and employment support. The keynote address for the evening was delivered by Gbenga Ogedegbe, MD, MPH Professor of Medicine & Population Health, Chief Division of Health & Behavior at NYU Langone Medical Center and NHEF Board Member. 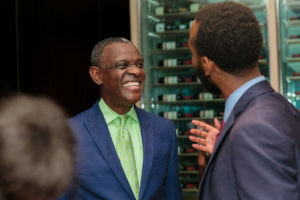 Dr. Ogedegbe shared how his involvement with the NHEF encouraged him to involve other professionals in establishing medical programs throughout Africa. These programs provide upcoming medical professionals the opportunity to gain knowledge and experience through mentor-mentee partnerships. In 2016, our first NHEF Scholars Program cohort consisted of 15 Scholars. Since then, the program has grown significantly to nearly 100 Scholars, an accomplishment of which we are very proud. Our vision of preparing the next generation of Nigerian Leaders is made possible by the continuous support our generous NHEF community. If you would like more information on the Scholars Program or to sponsor a Scholar, please contact us at info@thenhef.org. Click here to view additional photos from the event.